I started a page called Tipping point, with a nice map listing various possible 'tipping elements' in the biosphere. We need to rank these for likelihood. The article by Lenton et al. helps a lot. I was actually reading this to get some sense of how bifurcations . 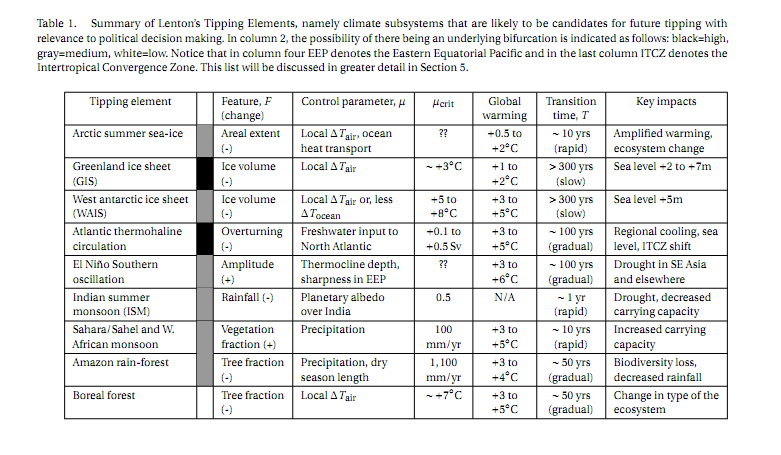 the 1st table has Lenton's "tipping element" ,"probability of underlying bifurcation", "feature /change", "control parameter" (cp), "critical value of cp", "global warming" temp, "transition time" and 2key impacts" in the last column. So even if you don't intend to read the whole paper at least glare at the Tipping point here once in a while! I restructured this page and added a section on costs. Comment Source:I restructured this page and added a section on costs. Johan Rockstrom et al., A safe operating space for humanity, Nature 461 (24 September 2009), 472--475. Anthony D. Barnosky et al., Approaching a state shift in Earth’s biosphere, Nature 486 (2012), 52-58. Abstract: Localized ecological systems are known to shift abruptly and irreversibly from one state to another when they are forced across critical thresholds. Here we review evidence that the global ecosystem as a whole can react in the same way and is approaching a planetary-scale critical transition as a result of human influence. The plausibility of a planetary-scale ‘tipping point’ highlights the need to improve biological forecasting by detecting early warning signs of critical transitions on global as well as local scales, and by detecting feedbacks that promote such transitions. It is also necessary to address root causes of how humans are forcing biological changes. Comment Source:Thanks, Staffan! Some papers have become freely available so I've added links to them on our page [[Tipping point]], and polished things up a little bit here and there: * Johan Rockstrom _et al._, [A safe operating space for humanity](http://multivu.prnewswire.com/mnr/stockholmresilience/40125/), _Nature_ **461** (24 September 2009), 472--475. and * Anthony D. Barnosky _et al._, [Approaching a state shift in Earth’s biosphere](http://www.stanford.edu/group/hadlylab/pdfs/Barnoskyetal2012.pdf), _Nature_ **486** (2012), 52-58. *Abstract*: Localized ecological systems are known to shift abruptly and irreversibly from one state to another when they are forced across critical thresholds. Here we review evidence that the global ecosystem as a whole can react in the same way and is approaching a planetary-scale critical transition as a result of human influence. The plausibility of a planetary-scale ‘tipping point’ highlights the need to improve biological forecasting by detecting early warning signs of critical transitions on global as well as local scales, and by detecting feedbacks that promote such transitions. It is also necessary to address root causes of how humans are forcing biological changes. Peter Ashwin, Sebastian Wieczorek and Renato Vitolo, Tipping points in open systems: bifurcation, noise-induced and rate-dependent examples in the climate system. In the last few years, the idea of “tipping points” has caught the imagination in climate science with the possibility, also indicated by both palaeoclimate data and global climate models, that the climate system may abruptly “tip” from one regime to another in a comparatively short time. This recent interest in tipping points is related to a long-standing question in climate science: to understand whether climate fluctuations and transitions between different “states” are due to external causes (such as variations in the insolation or orbital parameters of the Earth) or to internal mechanisms (such as oceanic and atmospheric feedbacks acting on different timescales). A famous example is Milankovich theory, according to which these transitions are forced by an external cause, namely the periodic variations in the Earth’s orbital parameters. Remarkably, the evidence in favour of Milankovich theory still remains controversial. Hasselmann was one of the first to tackle this question through simple climate models obtained as stochastically perturbed dynamical systems. He argued that the climate system can be conceptually divided into a fast component (the “weather”, essentially corresponding to the evolution of the atmosphere) and a slow component (the “climate”, that is the ocean, cryosphere, land vegetation, etc.). The “weather” would act as an essentially random forcing exciting the response of the slow “climate”. In this way, short-time scale phenomena, modelled as stochastic perturbations, can be thought of as driving long-term climate variations. This is what we refer to as noise-induced tipping. Sutera studies noise-induced tipping in a simple global energy balance model previously derived by Fraedrich. Sutera’s results indicate a characteristic time of 105yr for the the random transitions between the “warm” and the “cold” climate states, which matches well with the observed average value. One shortcoming is that this analysis leaves open the question as to the periodicity of such transitions indicated by the power spectral analysis. There is a considerable literature on noise-induced escape from attractors in stochastic models. These have successfully been used for modelling changes in climate phenomena, although authors do not always use the word “tipping” and other aspects have been examined. For example, Kondepudi et al consider the combined effect of noise and parameter changes on the related problem of “attractor selection” in a noisy system. More recently, bifurcation-driven tipping points or dynamic bifurcations  have been suggested as an important mechanism by which sudden changes in the behaviour of a system may come about. Comment Source:I found an interesting paper on tipping points and added it to our page [[Tipping point]]: * Peter Ashwin, Sebastian Wieczorek and Renato Vitolo, [Tipping points in open systems: bifurcation, noise-induced and rate-dependent examples in the climate system](http://arxiv.org/abs/1103.0169). Some quotes: > In the last few years, the idea of “tipping points” has caught the imagination in climate science with the possibility, also indicated by both palaeoclimate data and global climate models, that the climate system may abruptly “tip” from one regime to another in a comparatively short time. > This recent interest in tipping points is related to a long-standing question in climate science: to understand whether climate fluctuations and transitions between different “states” are due to external causes (such as variations in the insolation or orbital parameters of the Earth) or to internal mechanisms (such as oceanic and atmospheric feedbacks acting on different timescales). A famous example is [[Milankovitch cycles|Milankovich theory]], according to which these transitions are forced by an external cause, namely the periodic variations in the Earth’s orbital parameters. Remarkably, the evidence in favour of Milankovich theory still remains controversial. > Hasselmann was one of the first to tackle this question through simple climate models obtained as stochastically perturbed dynamical systems. He argued that the climate system can be conceptually divided into a fast component (the “weather”, essentially corresponding to the evolution of the atmosphere) and a slow component (the “climate”, that is the ocean, cryosphere, land vegetation, etc.). The “weather” would act as an essentially random forcing exciting the response of the slow “climate”. In this way, short-time scale phenomena, modelled as stochastic perturbations, can be thought of as driving long-term climate variations. This is what we refer to as noise-induced tipping. > Sutera studies noise-induced tipping in a simple global energy balance model previously derived by Fraedrich. Sutera’s results indicate a characteristic time of 105yr for the the random transitions between the “warm” and the “cold” climate states, which matches well with the observed average value. One shortcoming is that this analysis leaves open the question as to the periodicity of such transitions indicated by the power spectral analysis. There is a considerable literature on noise-induced escape from attractors in stochastic models. These have successfully been used for modelling changes in climate phenomena, although authors do not always use the word “tipping” and other aspects have been examined. For example, Kondepudi et al consider the combined effect of noise and parameter changes on the related problem of “attractor selection” in a noisy system. > More recently, bifurcation-driven tipping points or dynamic bifurcations  have been suggested as an important mechanism by which sudden changes in the behaviour of a system may come about. Marten Scheffer, Jordi Bascompte, William A. Brock, Victor Brovkin, Stephen R. Carpenter, Vasilis Dakos, Hermann Held, Egbert H. van Nes, Max Rietkerk and George Sugihara, Early-warning signals for critical transitions, Nature 461 (2009), 53-59. Abstract. Complex dynamical systems, ranging from ecosystems to financial markets and the climate, can have tipping points at which a sudden shift to a contrasting dynamical regime may occur. Although predicting such critical points before they are reached is extremely difficult, work in different scientific fields is now suggesting the existence of generic early-warning signals that may indicate for a wide class of systems if a critical threshold is approaching. Comment Source:I've been thinking lately that developing ways to detect 'tipping points' might be a practical activity for mathematical physicists such as myself. Here's another paper on this: * Marten Scheffer, Jordi Bascompte, William A. Brock, Victor Brovkin, Stephen R. Carpenter, Vasilis Dakos, Hermann Held, Egbert H. van Nes, Max Rietkerk and George Sugihara, [Early-warning signals for critical transitions](http://deepeco.ucsd.edu/~george/publications/09_critical_transitions.pdf), _[Nature](http://www.nature.com/nature/journal/v461/n7260/full/nature08227.html)_ **461** (2009), 53-59. > **Abstract. ** Complex dynamical systems, ranging from ecosystems to financial markets and the climate, can have tipping points at which a sudden shift to a contrasting dynamical regime may occur. Although predicting such critical points before they are reached is extremely difficult, work in different scientific fields is now suggesting the existence of generic early-warning signals that may indicate for a wide class of systems if a critical threshold is approaching. Stephen Carpenter, Regime Shifts in Lake Ecosystems: Pattern and Variation. S. R. Carpenter, J. J. Cole, M. L. Pace, R. Batt, W. A. Brock, T. Cline, J. Coloso, J. R. Hodgson, J. F. Kitchell, D. A. Seekell, L. Smith, and B. Weidel, Early warnings of regime shifts: a whole-ecosystem experiment, Nature 332 (2011), 1079-1082. Abstract. Catastrophic ecological regime shifts may be announced in advance by statistical early-warning signals such as slowing return rates from perturbation and rising variance. The theoretical background for these indicators is rich but real-world tests are rare, especially for whole ecosystems. We tested the hypothesis that these statistics would be early-warning signals for an experimentally induced regime shift in an aquatic food web. We gradually added top predators to a lake over three years to destabilize its food web. An adjacent lake was monitored simultaneously as a reference ecosystem. Warning signals of a regime shift were evident in the manipulated lake during reorganization of the food web more than a year before the food web transition was complete, corroborating theory for leading indicators of ecological regime shifts. Comment Source:An expert on dynamical systems pointed me to this work on tipping points, which I've added to our page [[Tipping point]]: <hr/> [Stephen Carpenter](http://limnology.wisc.edu/personnel/carpenter/) works on detecting tipping points in lakes. See for example this free online book: * Stephen Carpenter, _[Regime Shifts in Lake Ecosystems: Pattern and Variation](http://limnology.wisc.edu/regime/)_. or this paper: * S. R. Carpenter, J. J. Cole, M. L. Pace, R. Batt, W. A. Brock, T. Cline, J. Coloso, J. R. Hodgson, J. F. Kitchell, D. A. Seekell, L. Smith, and B. Weidel, [Early warnings of regime shifts: a whole-ecosystem experiment](http://faculty.virginia.edu/pace/documents/Publications/Carpeneter%20et%20al.%20Squeal_ScienceExpress_2011.pdf), _[Nature](http://www.sciencemag.org/content/332/6033/1079.abstract)_ **332** (2011), 1079-1082. > **Abstract. ** Catastrophic ecological regime shifts may be announced in advance by statistical early-warning signals such as slowing return rates from perturbation and rising variance. The theoretical background for these indicators is rich but real-world tests are rare, especially for whole ecosystems. We tested the hypothesis that these statistics would be early-warning signals for an experimentally induced regime shift in an aquatic food web. We gradually added top predators to a lake over three years to destabilize its food web. An adjacent lake was monitored simultaneously as a reference ecosystem. Warning signals of a regime shift were evident in the manipulated lake during reorganization of the food web more than a year before the food web transition was complete, corroborating theory for leading indicators of ecological regime shifts. Marten Scheffer, Critical Transitions in Nature and Society, Princeton U. Press, Princeton, 2009.
Review. Marten Scheffer accessibly describes the dynamical systems theory behind critical transitions, covering catastrophe theory, bifurcations, chaos, and more. He gives examples of critical transitions in lakes, oceans, terrestrial ecosystems, climate, evolution, and human societies. And he demonstrates how to deal with these transitions, offering practical guidance on how to predict tipping points, how to prevent "bad" transitions, and how to promote critical transitions that work for us and not against us. Scheffer shows the time is ripe for understanding and managing critical transitions in the vast and complex systems in which we live. This book can also serve as a textbook and includes a detailed appendix with equations. Comment Source:I added a link to this book, which one of my students seemed to be enjoying: * [Marten Scheffer](http://www.wageningenur.nl/en/Persons/prof.dr.-M-Marten-Scheffer.htm), _[Critical Transitions in Nature and Society](http://press.princeton.edu/titles/8950.html)_, Princeton U. Press, Princeton, 2009. This is not free online; the link takes you to this, among other things: > **Review. ** Marten Scheffer accessibly describes the dynamical systems theory behind critical transitions, covering catastrophe theory, bifurcations, chaos, and more. He gives examples of critical transitions in lakes, oceans, terrestrial ecosystems, climate, evolution, and human societies. And he demonstrates how to deal with these transitions, offering practical guidance on how to predict tipping points, how to prevent "bad" transitions, and how to promote critical transitions that work for us and not against us. Scheffer shows the time is ripe for understanding and managing critical transitions in the vast and complex systems in which we live. This book can also serve as a textbook and includes a detailed appendix with equations.